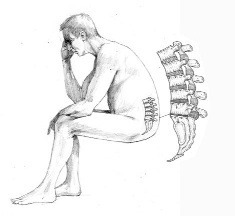 The Sarah Key Method is perhaps the ultimate form of natural back pain relief. As spinal therapy for problem backs, it works through the natural physiology and biomechanics of the intervertebral discs. It's highly effective and it's not rocket science. 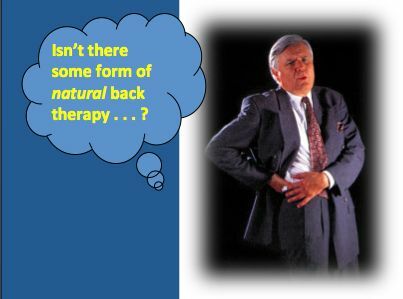 It seems reasonable to investigate whether there's any effective form of natural back care, since low back pain is so widespread there's little chance of the current medical systems stemming the tide. Quite apart from misery of day to day pain, the surgical solutions for dealing with low back pain are not ideal. There are few structures more mechanically sophisticated than the human spine, yet the surgical procedures are . . . well, quite primitive to say the least, and only appropriate in the most dire circumstances. Glancing at the picture of the disc above, you'll see that it is almost completely devoid of blood, except for the very outer rim of the back of the disc (the posterior annulus). This dictates that the nucleus, the round bauble of fluid at the centre of the disc, has a hard job getting a nutritional supply in and getting waste products out. The discs are known as 'living adaptable force transducers' (Butler and Mosely). 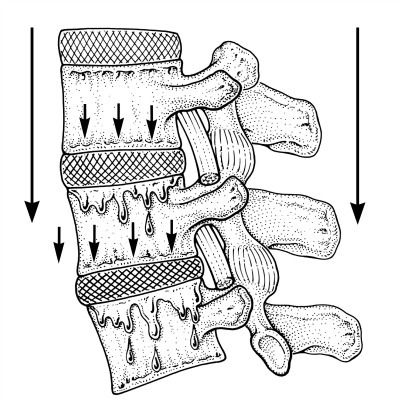 They act as both shock absorbers between the vertebrae and strong tensile links gluing those vertebrae together. As such, they endure extraordinary forces of attrition. Even healthy discs look worn and tatty, as the fibres of the tensile outer skin are pinged, torn and strained as part of everyday life. Lumbar Discs Have a Hard Job Keeping Alive! The cell population within intervertebral discs is sparse and the difficulty with the nutrient supply means the metabolic rate of discs is always slow. What the scientists call 'sustained loading' or longterm compression slows their metabolic rate even more. It literally smothers the discs, making it harder for the disc cells inside to 'breathe'. The slow metabolic rate of discs means they break down slowly. The flip-side is that they also repair slowly. This explains why natural back therapy is never an overnight thing. It also explains why you're better doing it yourself ~ quietly and judiciously every day at home ~ instead traipsing back and forth to a hospital, or private clinic, hoping they can do it for you. The higher the water content of discs the healthier they are and the better they perform, both at absorbing impact and holding the spinal segments securely together. Lumbar discs naturally lose approximately a quarter of their fluid throughout each day. Importantly, they lose more fluid, more quickly, with sitting. An important part of therapy for a bad back is getting discal fluid back. Lumbar discs are flatter and more dehydrated by the end of the day. They mainly recoup lost fluid overnight when the body is un-weighed horizontally, relaxed in sleep. But expansive bending and end-of-range stretching activities throughout the day keeps the lumbar discs more plump with fluid. Natural spinal therapy and pain relief is all about effective hydration and fluid return to the discs. Good health of discs relies on good disc hydration. Effective therapy for problem backs focuses on enhancing free and unfettered fluid flow in and out of the discs. Getting toxic waste products out of the discs is especially important in phases of acute back pain. With The Sarah Key Method the repair processes are focused on the back wall of the disc, the most likely source of pain. The 'pressure change therapy' regime is unique to The Sarah Key Method. What's important is doing it correctly. The next thing is doing it every day. This is where the videos come in; you re-play them while doing your block routine, off in a quiet corner somewhere. It's not only calming, it helps you visualise what's going on. With visualisation the metabolic processes actually work better. it may be easier to view than read . . .
Click here to read more about Spinal Decompression on various other pages on this website. You really cannot know enough!